In the summer of 1991 a private owner from Akron, Ohio had purchased and shipped the prop from the desert storage lot in Palm Springs to an aircraft hanger in Akron via a flat bed truck. Tom Wilson and myself were hired from the outset to recondition the prop (mainly just the repaint and lettering) - before we had seen the actual state of the craft when it arrived. Upon inspection, it was clear that a total restoration was necessary. It had been stored outside since its release from the studio many years earlier and time, weather and abuse had taken its toll on the mostly wooden prop. It was apparent that several previous restorations had been attempted in areas - but were mainly cosmetic. Luckily - the main framework had been left untouched. In September of 1991 - the Galileo began a two-year project to methodically restore her to studio-original condition. The wood framework was stripped and replaced from bow to stern, the metal frame blasted and re-primed, the exterior panels re-cut and mounted in marine-grade plywood, new floorboards installed in the interior. The work was staggering, but necessary - the woodwork was totally decayed and structurally unsound. The port side panel (masonite original) from just above the main door all the way back to the stern and just above the port wing/nacelle was left original. The stern was also in fairly good condition with the exception of the impulse engine area which was completely gone along with the roof. The owner had also contracted Gene Winfield (the original builder) to fabricate some new pieces. 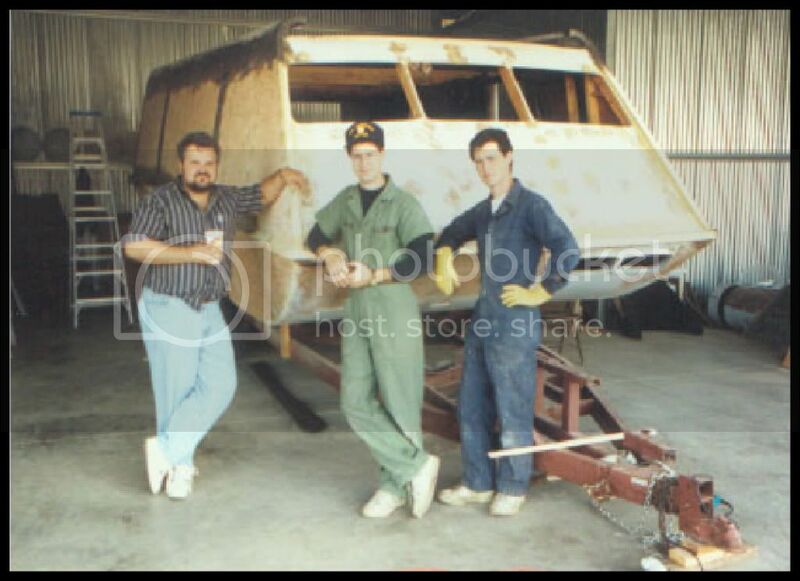 Two new plexi nacelle domes (clear) and the metal baffle shrouds were received the following year. An hurried attempt to make her presentable for the local convention (LagrangeCon 91) was her last public appearance to my knowledge. Work continued on when we moved the craft to its own private hanger at Akron-Canton airport. Both nacelles were constructed almost entirely in steel and extremely heavy. They were transported individually from the main hull and remained that way in the hanger while work progressed. They were designed to be easily removed and replaced and basically slid into position on several steel pins (in the wing root area). The door mechanism was pretty complex and was fabricated from desk parts - mainly the track system for the upper door halves. The lower door/porch was opened by an operator inside using a large steel lever. There was never any intention of building an interior since this almost-full scale prop never had one. Outside of possibly carpeting the floor and dressing the interior wall opposite the hatch, the port side interior was all door mechanism and track. You could not stand upright inside the craft. If one were to be built - that was a later concern. One the trickiest areas to rebuild was the impulse deck - luckily what remained of the delicate lower lip provided enough patterns to reconstruct it. By September 1993, the two man team was exhausted and the owner short on funds. The Galileo was was brought back to about 85% completed and a stone's throw from seeing it rolled out in a fresh coat of paint and detailed out with its 1701/7 lettering. We parted company when the owner began discussions with another party interested in purchasing and or finishing it off. Bill's Facebook photos of the Restoration work his team did is here.